Cintra, a global leader in Oracle Enterprise Architecture and cloud services, has won the 2016 North America Oracle Partner Achievement Award for ‘Engineered Systems Growth’. 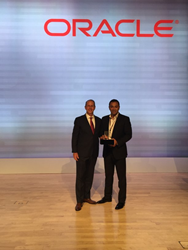 At an awards ceremony for the North America Oracle partner community, Oracle recognized the significant business transformations Cintra has delivered to its customers using Engineered Systems. These include organizations in travel and financial services, where Cintra has designed and delivered numerous business-critical architecture solutions using Oracle technologies, including Exadata Database Machine, Oracle Database Appliance and ZFS Storage Appliance. All Oracle North America partners are automatically considered for the award by Oracle’s partner management team. The winner is selected based on a number of criteria, including the business success its customers achieve, the services it offers around Oracle Engineered Systems, its expertise in the full Oracle stack, and the business it generates for Oracle. Speaking after the win, Cintra’s CTO, Abdul Sheikh, said: “We’re delighted to have won the award. It underlines the value Cintra adds to our customers by being able to design, deliver and support end-to-end business transformations. These are based on our private cloud architecture solutions that provide consolidation, improve user experiences, ensure robust service levels and increase agility.